2. In prototype practice the flange radius (r) is not a simple radius. 3. On 3/4" scale there is a difference in back to back and wheel check between wheels designed to run on 3-1/2 inch gauge track which would be laid to have a flange-way designed for only these wheels and dual gauge track that was 3-1/2 and 4-3/4 gauge laid with 1 inch scale components. On the dual gauge we use a 3/4 inch scale diameter and width wheel with a 1 inch scale flange. 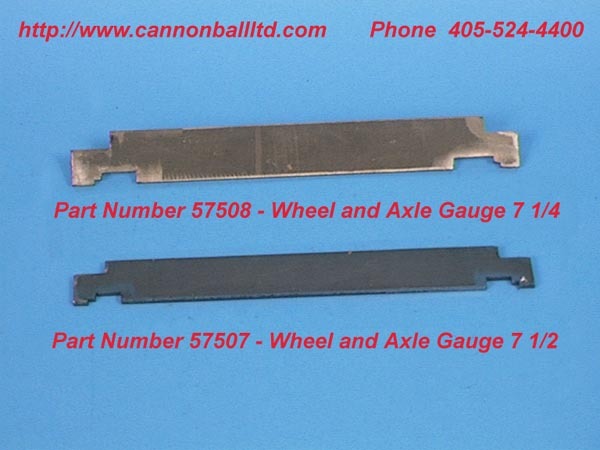 Since the track gauge value must remain the same even though the flange is wider it changes the wheel check and back to back dimensions to a smaller value. 2. LBSC pointed out that 2-1/2 inch gauge models are actually built to 17/32 inch scale. 3. Nick Edwards recommends minimum wheel width of 0.800 inches for 7-1/4 inch gauge equipment to be operated on dual-gauge track. See also the 1981 IBLS Wheel Standard. 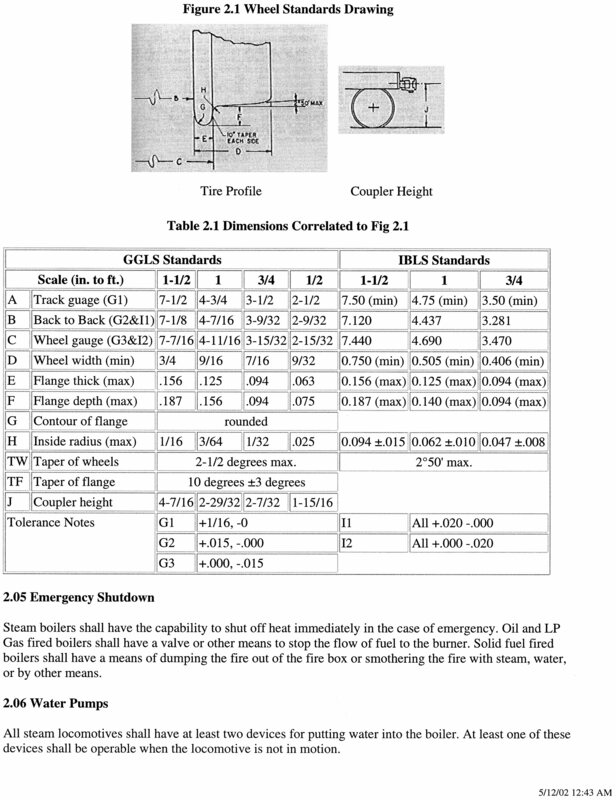 Here are IBLS Wheel Standards for individual gauges and scales. Track owners and clubs adopting IBLS Wheel Standards may include these documents in their handbooks. Many thanks to Bill Donovan of Real Trains Inc.
CAD Files have been created for the various IBLS Wheel Profiles using Autodesk Fusion 360 (which is available for use by hobbyists for free). The dimensions presented above were determined by careful consideration of several important factors. The white paper entitled "Determining Wheel and Wheelset Dimensions" lists and describes these considerations in detail. It will help guide modelers of non-standard scales to calculate dimensions for wheels and wheelsets, and is suggested reading for all modelers who design, build or inspect wheels. In order to allow inter-operation of equipment on multiple tracks a series of standard dimensions have been developed that apply to the design, production, and inspection of wheels and wheelsets (two wheels and an axle). The information that follows discusses some of the reasons for certain dimensions and provides guidance as to the selection of specific values for all required dimensions. The RMI Railworks RMI-25 Specification recommends using a taller flange for 2.5 inch and 3-3/4 inch scale equipment on 7.5 inch and 7.25 inch gauge track. See also "Another run of flange tools"
The efforts of this group were published in Live Steam Magazine, October 1974. The committee members were presented with the "10th Annual Live Steam Magazine Award" on December 1, 1979 by the late William Fitt, then-Editor of Live Steam Magazine. These "Interim IBLS Standards" have been widely adopted and have become the accepted wheel standards for the hobby. As worldwide communications improved and it became evident that having two standards for 1:8 scale modeling in the U.S. was counterproductive, an attempt was put forth to adopt a true standard for track gauge, wheel profiles and couplers. The organization known as the International Brotherhood of Live Steamers was formed, with representatives from areas around the world working with riding scale railroads. Via mailings, all known private and club railroads were contacted and asking for input on what the standards should be so a single set could be established. From the replies, it became abundantly apparent there was no easy solution within the U.S. and the I.B.L.S. settled on adopting and recommending standards following those being used in California and sent these out as “proposed standards” to everyone. Since these first included 7-1/2” as the correct gauge for 1:8 scale, they were never officially adopted by everyone and have remained as proposed ever since. However, in the U.S., these proposed standards have been used by most everyone for wheels and couplers and each area has used their local gauge standard. This has allowed for the trains to easily travel to other railroads and interchange equipment fairly easy, except for crossing The 1/4” Demarcation Line in the northeast. Today if you look at most IBLS wheel and coupler charts, you will find gauging standards for both 7-1/4” and 7-1/2” that have become the accepted standards by most. As the last East Coast secretary of the IBLS, and having known Mr. Purinton, the founder of the Brotherhood of Live Steamers, I can tell you he was not opposed to standards. He felt that there was no need to create "new" standards as there was already a published set of standards in existence since the dawn of the Twentieth Century. The "Live Steam" hobby came to us from England, and live steamers used the standards of the Society of Model and Experimental Engineers. These standards were developed by Henry Greenly, and are still used virtually all over the world....except here. Many clubs have 3-1/2 inch and 4-3/4 inch dual-gauge tracks (3 rails). These are laid with 1 inch scale rail and frogs. The 4-3/4 inch gauge is for 1 inch scale. The 3-1/2 gauge is for 3/4 inch scale. To be completely compatible any 3/4 inch scale equipment operating on this track should have flanges built to the 4-3/4 inch gauge standard (but the width can be as in 3-1/2 inch gauge). This is seldom done but the equipment is so small and light it is less of a problem. For 3/4 inch scale equipment I prefer to use the IBLS 1 inch scale 4-3/4 inch gauge wheel dimensions directly and then modify the three wheelset dimensions B (back to back), WG (wheel gauge), and WC (wheel check) by decreasing the 4-3/4 inch gauge dimensions by 1-1/4 inch, as shown in the table below. You cannot use the 3-1/2 inch gauge wheelset dimensions since the wider flanges from 4-3/4 inch gauge will change the back to back dimension. In a similar way there are some modelers that follow 1-1/2 inch scale narrow gauge (from 3 foot gauge prototype). They seem to all be in the United States so they run on 4-3/4 inch gauge track. If they have laid new track using 1-1/2 inch scale rail and frogs then the only change needed to the 1-1/2 inch scale standard is to decrease the wheelset dimensions by 2-3/4 inches. If they run on existing 1 inch scale tracks then they need special wheels with 1-1/2 inch scale width but 1 inch scale flanges. Here, the back to back (B) is the same as for 1 inch scale on 4-3/4 inch track. The following organizations use, recommend or require the IBLS Wheel Standard. Whether or not the wheel standards were "formally" adopted, so many clubs in the US (especially western US) use them they have become defacto standards. Yes, some clubs use other dimensions, and you should use what works for you and your club. As mentioned before, just because these dimensions are out there, you can still model however you want. As a testament to these standards, I was able to fly from California to New Jersey Live Steamers with my equipment, put the loco on the track, and run with no derailments. I like a set of standards, myself. On February 1st, 1899 a subcommittee of the Society of Model Engineers recommended five standard model railroad gauges (spacing between the rails) numbered 0,1,2,3 and 4. "Why train wheels have conical geometry"
This page was last modified on 19 March 2019, at 17:21.